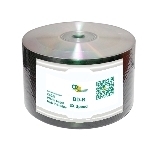 97672 Looking for a cost effective way to store large HD video and audio files? BD-R LTH is the solution. 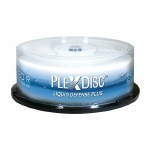 These discs have the same 25GB storage capacity of standard BD-R discs, but a more efficient manufacturing process allows the discs to be offered at a lower cost to consumers making them ideal for capturing your favorite HDTV programs or backing up your music collection. 97339 Create high quality, customized labels for your BD-R media with Verbatim White Inkjet Printable Blu-Ray Recordable discs. These discs have been extensively tested for compatibility with inkjet disc printers from Primera, Microboards, Epson and others. 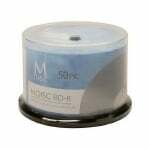 MEDB-10001 When you need Blu-ray media and cost is a major factor, consider Microboards' line of BD-R media, available in three different printable surfaces in 50-disc spindles. Choose from the sleek silver lacquer thermal, the clean white inkjet, or the ever-popular white Everest thermal surfaces, all of which are hub-printable, allowing printing all the way to the center of the disc. 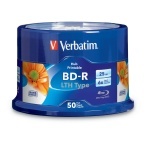 CDS-BDR6X-WIHP This Blu-ray disc series is on the cutting edge of technology using a blue-violet laser to record either high-definition (HD) video or high capacity gigabyte data files. Using the exclusive FMS (Flexible Manufacturing System) and sophisticated production know-how brings next generation products like recordable Blu-ray discs to market in the shortest time frame with reasonable pricing. Viewers will especially enjoy High-Definition video programming using this Blu-ray disc series. 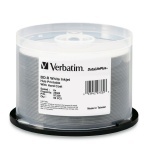 97334 Create high quality, customized labels for your Double Layer BD-R discs with Verbatim White Inkjet Printable BD-R DL discs. These discs have been extensively tested for compatibility with inkjet disc printers from Primera, Microboards, Epson and more. With a storage capacity of 50GB, these are one-time record discs, ensuring that your video, music or other information will not be erased. MEDB-21018 When you need Blu-ray media and cost is a major factor, consider Microboards' line of BD-R media, available in three different printable surfaces. Choose from the sleek silver lacquer thermal, the clean white inkjet, or the ever-popular white Everest thermal surfaces, all of which are hub-printable, allowing printing all the way to the center of the disc.